He got to see it – his cousin at another school in a more Republican part of the state did not. A speech by the President of the United States to the young students of our great nation – and it wasn’t aired to everyone? Parents in tears over the possibility of their school district letting their kids watch it? 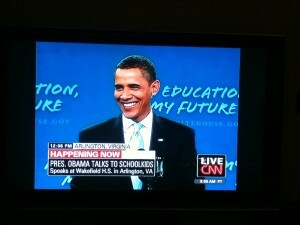 Threats to pull children out of school because they might be subjected to hearing the President (OUR President) speak? What is going on here???? All day I told myself breathe. Just take a breath. Yet every time I heard something more about it, I would feel my blood boil. After all, the transcript of the speech had already been released the day before. All concerned parties knew exactly what he was going to say. But that was never really it anyway, was it?